Abhay forms the head of this particular comic book Voltron, because I have to make sure I've done everything possible to get you to read his work. And that link pretty much encompasses that. From that post, about a comic I'm pretty sure I don't want to read now, I followed the link to Haspiel's "Fear My Dear." I've always liked Haspiel's art, but hadn't read any of his writing until I finished that story. Ten minutes ago. So, that was... different. It verged on giving me a headache, but there were a couple funny turns of phrase (I like that he uses karate as a curse, for some reason), and it's a stylistic choice, so somehow that's easier for me to accept than if I thought he just couldn't write any other way. I mean, I used to read his blog and I don't remember him talking exactly like that, so I think he's doing it knowingly. For some reason, that makes it better on a technical level to me. Although, if he does actually talk like that, or know people that talk like that, I want to hang out with him now. And really, stylized dialogue is not a deal breaker for me, and having read over it a second time now, I'm pretty well used to it. I fixate on the writing because I love the art, but can't really find any appropriate way to appraise it. I mean, the coloring is nice. Good use of yellow. I'm a sucker for Kirby-isms, too, and you get a lot of those in the visual style. And there's no self absorbed alcoholics, so I think I'm pretty sure I like this free comic more than the fancy hardcover Vertigo wants to sell me that Sarah Silverman apparently likes. That's another deal breaker for me, really. But at least Abhay makes it sound like an interesting piece of packaging! Of course, my taste is suspect to a lot of folks, I'm sure, especially because my front runner for favorite OGN is the Prince of Persia book First Second published recently. That I totally requested called thought in to existence. Just want to take credit for that. This is just based on the first third of the book or so, but in that space, we get fights with a lion, a boar, and an army of skeletons and a smart assed peacock as one of the characters spirit totems. On the Chris Sims Scale of Awesome, that's pretty damn praiseworthy. Well, there's that, the lovely art, and an interesting story. Hell, even the afterword is pretty rad, especially if you geek out over POP artifacts. That last one is a valid way to judge it against all other GNs this year, right? "There's a distinct lack of character models of the Vizier in Acme Novelty Library, Mr. Ware, so that's a pretty glaring flaw in your novelty library." Moving on to non bound, lavishly printed comics, I got this series in the mail the other day. As you can tell from this, Bill swears by it, and that was enough to sell me, since we have similar tastes. I liked the first issue. It lives up to its hype pretty well. There was this nagging voice in my head that kept bringing up Identity Crisis, but it was pretty easy to ignore, since I never did actually read that particular series. That said, I did have some non-clumsy retcon based problems for me. Well, more like something that stuck out as weird than a fatal flaw or anything. It's the first issue of a completed four issue series (from 1992), so it's equally off kilter to bring attention to this at all. But I might as well while I'm here. Sue and Ralph are having marital problems. Without coming off as shrill, she seems pretty bemused by some of Ralph's goofier tendencies, like his tendency to announce that he's the world famous Elongated Man whenever he enters a room. That and all the supervillain fights. I imagine any woman would be pretty non-plussed by that. Mainly because I can only imagine how women react to things. So, Gerard Jones is writing their relationship pretty well. They seem to be acting like a real couple that's been together for a while. But it kind of clashes with all the super-mystery intrigue a little. I do appreciate that Jones is setting up some tension in their relationship by introducing a guy who's totally the villain and is also in to Sue without making Sue slaver over him or anything. You can tell she's got some interest, but he plays it very subtly, especially for a superhero comic. Maybe it's the late Mike Parobeck's (excellent) art that's tripping me up; it's got that whole cartoonist vibe, and I associate it mainly with the Batman animated comics. And Sue's in her lingerie during this particular conversation, so there's this whole "Now, here's something here for the guys!" vibe. I'm having a hard time reconciling all of these things, and that's without throwing in sly political references and stuff about a former adult film star turned founder of the Pink Party. So, that also stuck out a bit to me. 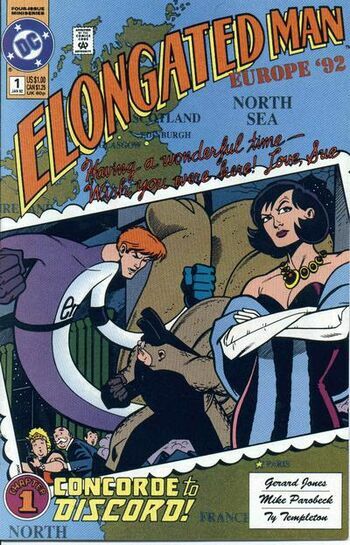 But hey, it's all pretty light hearted and well written and drawn, so it's the best Elongated Man story I've ever read by default, and that's after one issue.